There’s no planned giving program without planned giving marketing. Too few people know about planned giving opportunities for your program to skate by with minimal promotions. It’s important that your planned giving marketing efforts both educate donors about this unique giving opportunity and showcase the value of donating these high-impact gifts. 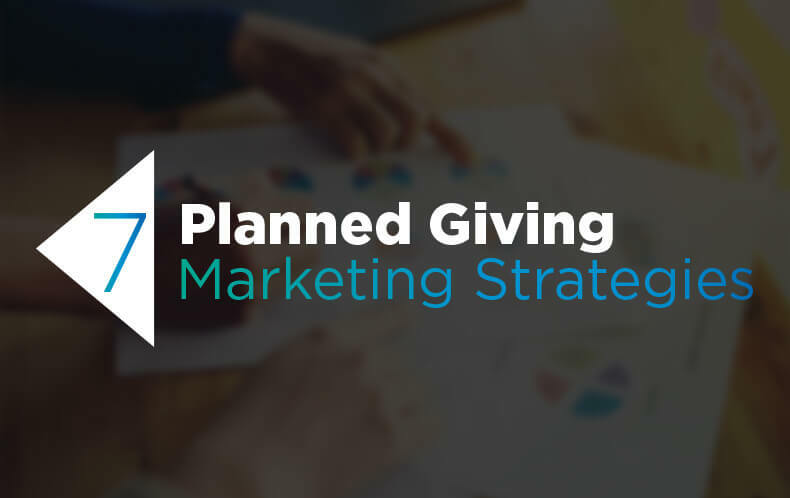 Let these strategies for planned giving marketing lead the way. As a nonprofit, you have a marketing infrastructure already in place. Why let that go to waste? The ‘ways to give’ page on your website. None of these marketing options are about writing an encyclopedia on planned giving. These are focused on getting the word the out there, putting planned giving on your donors’ minds. In most instances, a brief blurb about your new planned giving program will do the trick. Your existing marketing materials are there to get donors talking and asking about planned giving. This mean you have to give them somewhere to send their questions. Direct questions to your planned giving officer if you have one, or at least give interested parties a specific contact at your organization to reach out to. You will also be able to direct questions to your dedicated planned giving page on your website. What’s that you ask? I’ll explain right now, because it is planned giving marketing strategy number two. Takeaway: Using short, focused advertisements in your current marketing materials can be used to direct interested donors to more substantial resources. In the age of the internet, you can bet that donors will want to be able to learn more about your planned giving program quickly and conveniently. Give them the chance to educate themselves about your organization’s planned giving program by putting information where they like to find information — online. Whereas your planned giving mentions in your existing marketing materials do not require many expanded explanations, this dedicated planned giving page needs that educational copy. It’s where you’ll be able to direct people who have heard about your campaign through the other marketing sources, so it’ll need to be informational. Open with a general discussion of what planned giving is, as an introduction for some and a refresher for others. Then you’ll need to determine how you want to structure the vital information your donors are seeking. Your planned giving options. For example, if you’re only accepting bequests, it’s important to clarify the parameters of your program upfront. Be sure to clearly define each giving option by explaining what the gift means for the donor. Your planned giving levels. Are there certain donation milestones that will lead to higher recognition? It’s important that your donors understand how they will be stewarded once they’ve committed to a specific amount or percentage. Resources and contact information. Planned giving is a complicated subject with a lot of jargon. Invite your donors to learn more by allowing them to schedule an in-person meeting or phone call with trained staff members, your nonprofit’s resources allowing. Think through any questions you might have if you’d never had an experience with planned giving and/or your program, and make sure you answer them. You can even structure your page in a Q&A format. For example, ask “How can I give a gift that works for me?” and answer with your planned giving options. Optimize your page with web design best practices. While content is an important part of your planned giving page, how the page is designed is equally important. Donors are more likely to stay on your page longer if it’s well-designed and organized in an appealing way. With a few simple website design best practices, you can create a planned giving page that will draw donors in and provide them with all the necessary information. Make sure the page is mobile-responsive. Many of your donors will look at your planned giving page on a mobile device or tablet. If donors have to swipe or pinch to read your page’s copy, they’re likely going to leave out of frustration before they get the information they want. With a mobile-responsive page, donors will have an optimized viewing experience, no matter what device they’re using. Keep your brand consistent. Your planned giving page should match the rest of your website’s brand. That way, when donors land on the page, they know they’re still learning about your nonprofit. With consistent branding throughout your website, donors will feel more comfortable going with your planned giving options. With a well-designed webpage, your donors will stay on your page longer to find the information they need. Plus, when you have a strategic layout for your content, donors have a clear understanding of the next steps you want them to take. If your organization doesn’t want to implement these web design changes on your own, why not hire a nonprofit website design company? These companies can not only make crucial changes to your website’s design but also suggest other ways to improve your donors’ user experience. Takeaway: Create a planned giving page to break down complicated planned giving information and educate interested donors about their options. This will be the hardcopy of what you built on your website. It will be a great leave-behind after meetings and information sessions and a useful resource to mail to donors. With brochures, you have printing and mailing prices to consider, and many organizations recommend creating a brochure for each type of planned gift you accept. It that gets too costly, you can put all of the information in one brochure, or you can pick and choose certain program offerings to highlight. Define the type of planned giving. Provide a description of how the process works specifically at your organization. Include a testimonial from someone who has already committed to donating a planned gift that lets the person explain why he/she decided to go this donation route and how he/she connects with the program. Discuss the various benefits that come with donating this type of gift. A tangible brochure for people who prefer information printed communication channels will help you reach all of your donors most effectively. Takeaway: A planned giving brochure provides a physical copy of valuable planned giving information that can inform donors in tandem with your website. In-person meetings are a great place to take your brochures and connect with your donors. Planned gifts are often major gifts in disguise. You give your high-value, major gifts donors face-to-face time, and you should do the same for your planned gifts prospects and donors. Never underestimate the marketing power of a program pitch where you can look the prospect in the eyes, immediately address any questions, and make a genuine connection with the person across the table from you. Planned gifts can get complicated quickly when legal procedures, tax requirements, and financial terms are all thrown in at once. One in-person meeting can clear up any confusion much sooner than a chain of emails could. And, you always want to be driving focus to the reasoning behind the program: serving your mission. There’s no better way to do that than to explain it to a supporter, person-to-person. Don’t let meaning get lost in the shuffle. It should be driving the shuffle shuttle. Your planned giving marketing materials and methods will have a much greater impact if they are rooted in your cause. Takeaway: In-person meetings allow your organization to reassure donors about legal complications and emphasize the importance of planned giving to achieving your overall mission. Going off of the same thread that was started with the above strategy, your program needs to be directly tied to your mission and your cause. There are numerous elements to a planned giving program, but none should be as valued as the program’s purpose of raising funds for your cause. To be reflective of that need, ensure that your marketing copy skews more sentimental than technical. There will be times to go the technical direction, like when defining terms. But you should balance out any jargon-heavy moments with a reset to your mission and cause. You can also promote what a planned gift can mean for the donor. Donors who want to make a lasting and permanent difference for your organization will be naturally drawn to planned giving. Be sure to focus your language on what the donor can accomplish with their gift. This involves writing in second person whenever possible, which centers the action on the donor. Don’t put up an unnecessary wall with too much planned giving language and talk of taxes and financial planning. Those discussions will have to come, but, especially in the beginning, keep the emotional ties as a major part of the conversation. Takeaway: Craft your language around what planned giving means to your organization, so that prospects understand how they can help the people, communities, or animals that they care about with a planned gift. Branding your planned giving program means carefully crafting its image so that donors want to join your cause. A brand is a means of keeping your marketing materials consistent across multiple channels and appeals. It’s the “heart” that your organization wears on its sleeve. An enticing planned giving program will offer more than perks to donors; it should offer a prospect a place in a community of philanthropic people working together in support of your cause. Planned giving programs are often branded as legacy programs, where donors leave a lasting impact with their gift. Branding can also include creating a program logo, which will appear on the materials that you send out to your members. Once you’ve determined your program’s name and look, you’ll need to develop your brand’s message. Testimonials of current members. What do these members have to say about their own involvement? Your current members are the program. Showcase their valuable insights. Perks of joining. Some of the incentive for your program should be the exclusive perks that it offers. Perks can include opportunities to voice opinions to your board, or even a simple, exclusive product, such as a t-shirt or hat. Overall benefits to your cause. A planned gift has huge impact potential for your nonprofit’s mission. Emphasize this fact in your nonprofit’s branding so that donors receive a consistent message about the program’s benefits. All of these factors should be implemented into how you present your program. To craft the best brand for your program, be sure to highlight the cause in your slogan, using active, donor-centric language. Takeaway: Creating a consistent brand for your program will keep your message focused, consistent, and relatable to your prospects. Your marketing materials are only part of marketing your planned giving program. You’ll still need to determine when, how, and to whom you direct the information. A marketing plan will help you create the most effective strategy to reach your donors. Budget. How much can you afford to spend on each channel? Printed materials will cost more than online materials, so it’s important that you allot the proper amount of funds for each. Your target donors. 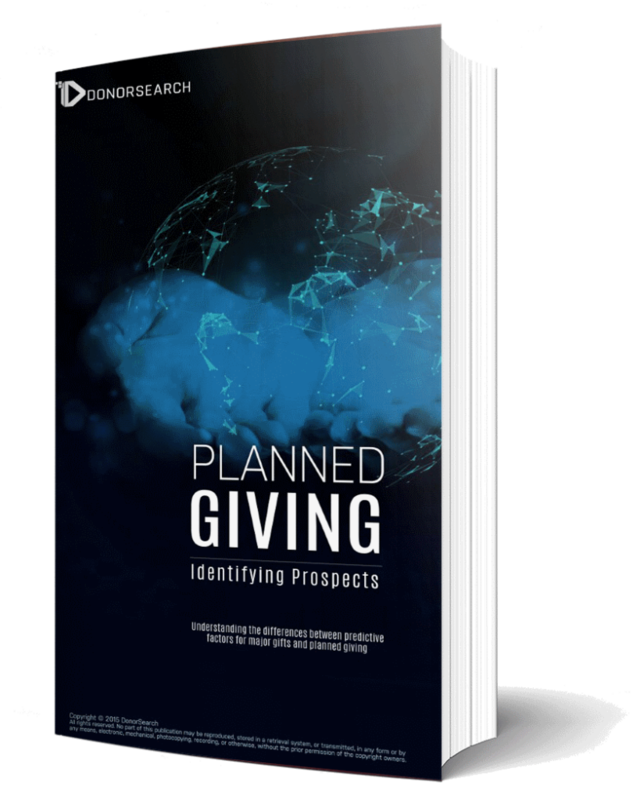 Determining who you should direct your planned giving materials to can be made much easier with prospect research. Indicators such as donor loyalty can be huge factors in identifying your top planned giving prospects. Marketing schedule. You don’t want donors to be overwhelmed by your marketing materials. You’ll need to schedule them in consideration with your other materials, such as thank you notes and formal asks. Understanding these considerations can help you create a cost-effective, precise, and incentivizing marketing plan. Takeaway: A marketing plan can help you keep all of your outreach on track, so that each planned giving communication is effective. Ready to continue learning about planned giving? Our Complete Guide to Planned Giving is filled with much more content like this article. Want to learn more about Planned Giving? Request our free white paper today.